Homeowners across Colorado love the outdoors, plain and simple. Our sunny state provides the perfect backdrop for a wide range of activities, giving locals a taste of the elevated life that is now bringing new residents in droves. Whether you’ve lived in Northern Colorado your whole life or are currently settling into your first home here, it can prove very beneficial to have an outdoor deck attached for daily enjoyment. Homeowners across the state contact our local deck contractors to help them find beautiful, long-lasting results that enhance your space. Rocky Mountain Fence & Decks is proud to be your trusted decking company in Larimer County, providing pergola designs, porch installations, perimeter fences, and more with guaranteed quality. Our service is tailored to provide the same level of quality across many jobs, yet the homeowners we help often come to us with much different goals and plans in mind. 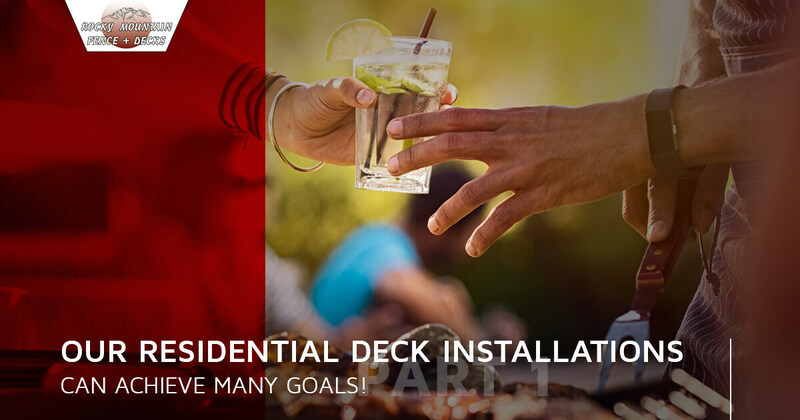 If you’ve been on the fence about investing in custom deck solutions, be sure read up on our list below highlighting a few common motivators for making the call. One major benefit of a quality deck installation is the increase in access to the yard. Your new system will be designed to maximize your outdoor surface space, often with the option of adding stairs to allow for easy entry to the lawn below. Many homeowners make do without direct access from the home to the grass, having to go around on a daily basis. Our deck installers can help to create an ideal deck design for your Loveland or Fort Collins home, delivering affordable solutions that can make your grass much more adjacent. Our custom deck designs allow for success across many projects. Whether you want a landing for your deck, railing lights, or even a slide for a quick descent, the Rocky Mountain team has the experience needed to get the job done right. Outdoor living spaces can be enjoyable for homeowners with any budget, and if your Loveland or Fort Collins home is quickly becoming too small, our deck contractors can help to create a space-saving solution. The entrance onto your outdoor decking may prove to be the perfect place to begin planning your project, introducing new entertainment space, cooking appliances, and more to create an outdoor living area that caters to your needs. Rocky Mountain Fence & Decks is proud to provide unbeatable outcomes with all of our deck installation services across Larimer County. We understand that building an outdoor living space can be a complicated process, relying on sturdy foundations to introduce heavy appliances and furniture that normally necessitate a range of paperwork. Call our decking company today, and let our team provide a quality plan that expands your living space effectively and affordably! We all wish we spent more time with loved ones, but few people can actually make the time or provide the accommodations for hosting social events. If your home is not built to host groups of people, a new deck may prove to be the perfect addition. Simple designs can provide major improvements for those looking to throw a nice bash, increasing surface space while allowing for a range of other unique improvements. Introducing a nice seating area, whether it include chairs and a table for dining or padded benches for lounging, will give your guests space to sit feel comfortable. Some homeowners have found success in building an outdoor bar, keeping everyone’s thirst quenched in the process. While many Coloradans are happy to host grand shindigs and soak up the sunshine, but those looking for culinary improvements will be happy with the results from Rocky Mountain Fence & Deck. Our hardscaping contractors know how to incorporate numerous cooking elements in a safe, efficient manner that allows chefs to create their masterpieces in the outdoors. Enhanced cooking spaces can also prove useful in homes where space is tight, such as larger families or roommate situations. Regardless of your needs or goals for your outdoor space, the Rocky Mountain Fence & Decks team is here to help. Our Loveland deck installers have worked in the industry since 1992 to deliver high-quality results for each of our customers. Next time, we’ll conclude this series by discussing a few more motivators that may help you decide on deck installation services. Contact us today to learn more about our services and be sure to ask for a project quote!